Find tips and information about different kinds of display lights to help you showcase and illuminate your display items. Includes both commercial and residential applications. Jewelry doesn’t sparkle and shine on its own – the reason a gem looks radiant is because of the way it reflects light! That being said, lighting is integral to retail design in a jewelry store. You want your displays to entice customers and show off your products in all their brilliance! Hopefully, we can help. This post will lay out options for various jewelry lighting displays. Planning on featuring jewelry within shelving units alongside a wall of your store? It’s a great way to display a large amount of inventory, but it’s important to make sure items don’t get lost in the shadows. For the most dramatic effect, use puck lights to call attention to individual pieces, as seen in the photo to the right. Puck lighting above jewelry creates beautiful silhouettes and puts a spotlight on each piece. It can be difficult to visualize exactly how a display lighting fixture is going to look after installation. Unlike decorative pendants or elegant chandeliers, the focus is not the light fixture. In fact, you usually know a display light is doing its job if you hardly notice the light fixture at all! 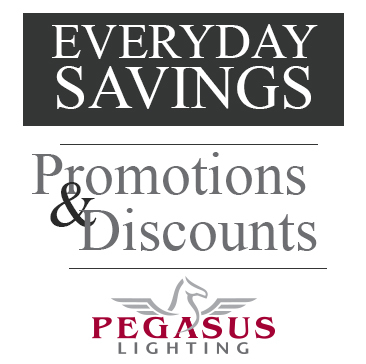 We have a wide variety of display lights – halogen, LED, flexible, battery-operated, and more. Admittedly, the product images we have are not too exciting. The shining moment for a display light, if you will, is after installation. Once they’re illuminating that exhibit or painting, you can see the point. This is our PAR Halogen Telescoping Display Light. We’ve heard back from customers who have used this for museum exhibits, trade show booths, retail displays, signs, wall hangings … the list goes on. One of our favorite applications for this light is depicted in the photo below. Held each year in South Dakota, the Motorcycles As Art exhibit “captures the personal expression, creativity and spirit that permeate the history and culture of motorcycling.” Photographer Michael Lichter used this display light as gallery lighting for the exhibit. Display lighting makes your exhibit more alluring. That doesn't mean it needs to make your exhibit more complicated. When it comes to designing enticing displays in retail stores, there’s a lot more that goes into it than deciding where the “Sale” sign should go. Studies have shown that buying decisions are affected by store layout, lighting, music, and even scent. The Smell & Taste Research Foundation in Chicago has conducted a number of studies evaluating how certain scents can impact mood and perception. One study placed an identical pair of Nike sneakers in two identical rooms – except one was sprayed with a mixed floral scent and one was odorless. When shoppers filled out surveys evaluating the sneakers, a whopping 84 percent said they preferred the sneakers in the floral-scented room, and that they’d pay about $10 more for them. Clearly, sensory perceptions affect our opinions on products. Last month, we had a customer from Natchez, MS call for assistance on what lighting might work best for his upcoming project. He was completing a display cabinet in his music room and wanted to incorporate accent lighting into the shelves. After seeing a picture of his unfinished cabinet, we recommended our LED recessed mini swivel lights. We are happy to report that the finished result looks absolutely beautiful, and the customer sent us a picture to prove it! One of our customers used xenon low voltage puck lights to help illuminate a booth display at the Baltimore Craft Show of the American Craft Council. Experts say that proper lighting at your exhibit will directly impact your success at trade shows. It’s all about calling attention to your offer with an illuminating display that draws in attendees. Before heading to your next trade show, assess your lighting inventory. Making a small update to improve your display might be the key to improving upon last year’s numbers. So, where should you start? First of all, make sure you are using several different types of lighting for the display. The variety will make your exhibit more interesting and professional-looking, especially if the lighting is coming from two or three directions.